Urison Kokulbekov of Tajikistan won the Heavyweight Boxing Competition in Guiyang. Even with the drastic differences in amateur and professional boxing a lot of guys do make that transition and have a lot of success with it. 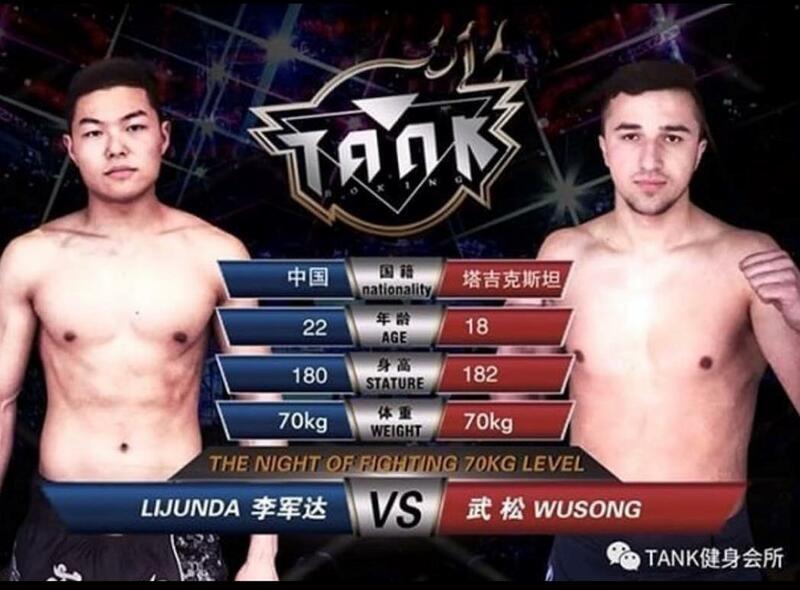 One of the top scouts in Guiyang these days is the current Heavyweight Champion of The Tank Boxing Association. 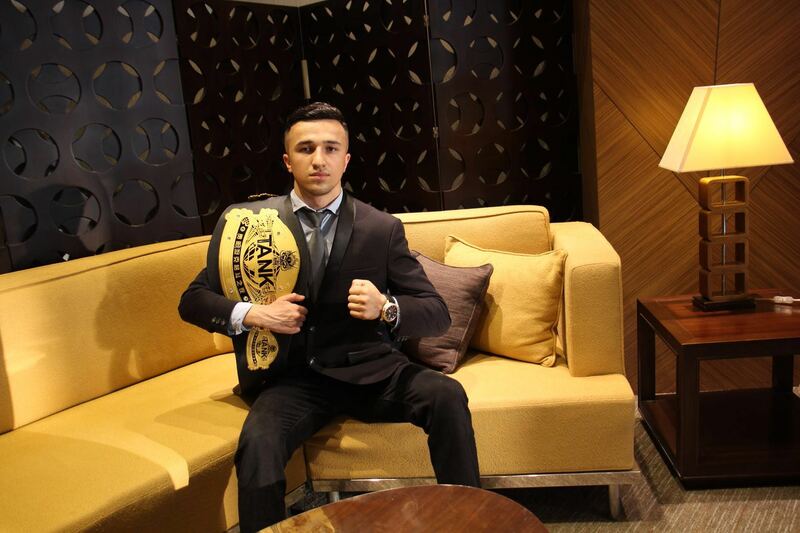 Urison Kokulbekov, is a student of Guizhou Institute of Engineering and Technology and is currently a talent scout for the Tank Boxing Association. He focuses much of his efforts on boxing which flows in his arteries, veins and capillaries. He’s credited with winning the current Tank Heavyweight Championship in Guiyang. His dream is to become a successful entrepreneur, as well as boxer. He looks forward to do his higher studies from a top university. He likes Harvard or the London School of Economics. Two engines for a long Gaotie train. I recently discovered that Guiyang has a fourth rail station. We.had one conventional rail station during the sixteen years since I first visited Guiyang in 2000. Then there were three with the addition of a high speed rail station at the new airport and the north high speed rail Station called Beizhan. I just arrived at the East Station (Dongzhan), from Kaili, about 110 miles away.. It has been open for a couple months. Now there are four train stations . . . one conventional and three high speed rail (300 kph or 186 mph). The high speed rail is called Gaotie, which loosely translates as “High Iron”. The infrastructure investment is very aggressive here, We have had three train stations and a replacement air terminal open in the last three years. A ring road and a Bus Rapid Transit (BRT) line circling the city has also been completed during that period. 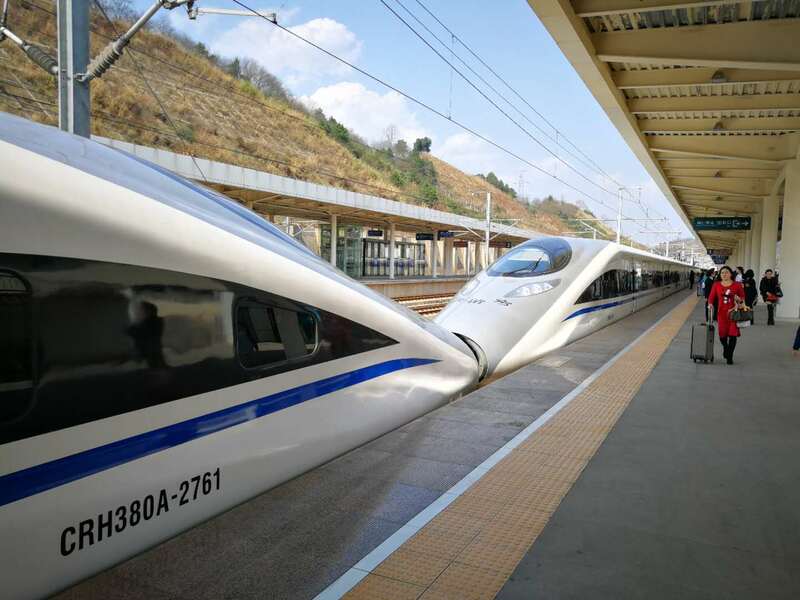 Cost in time and cash of yesterday’s trip from Kaili is as follows：Kaili kindargarten to train Station, 30 minutes and 4 rmb; Kaili rail station to Guiyang rail station, 35 minutes and 53.5 rmb; Guiyang East Station to my home by bus, 21 minutes and 2 rmb. The short walk to my apartment cost seven minutes and about 16 calories (no cost, calories were borrowed from surplus). It took about an hour and a half including wait times for buses and trains. Total cost from kindergarten to home, about 130 miles was just about 60 rmb, or approx. $9.50. 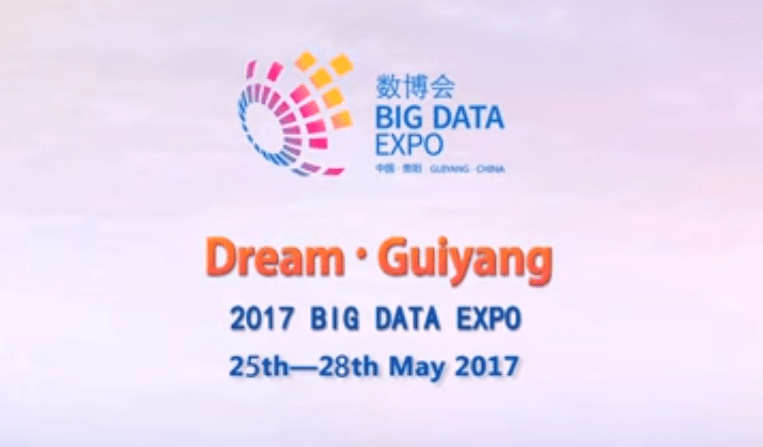 The 2017 Guiyang Bid Data Expo promises to be the best ever. It is getting progressively difficult to keep politics out of this www.tourguizhou.com web site. As an American, I am affected by activities in my home country and don’t feel inclined to be silent. Expats around the world have the same problem. Not as familiar is the Chinese Exclusion Act, which had essentially the same effect as the Trump action, blocking borders and preventing legal citizens and immigrants from re-entering the USA (1882-1943) . . . see: Chinese Exclusion Act. The net effect of this 60 years of evolving legislation was to greatly limit the growth of the Chinese Community in the USA. The USA was a white and Christian place and wasn’t about to allow large communities of minorities to prosper at the expense of the majority. Even Jews and Catholics were persecuted in various ways, with the most flagrant abuse taking place in the USA’s courts between 1921 and 1927. Two Italians, Sacco and Vanzetti, were executed for a murder that they didn’t commit (There had been a confession to the murders in 1925). See: Sacco and Vanzetti . The desire to prevent large groups of potentially hostile minorities from undermining national initiatives was also evident against the Japanese during WWII. The Roosevelt administration rounded them up and put them in internment camps. See: Japanese Internment . Without belaboring the point too much, the Trump ban on Muslims is inconvenient to explain to the young people who have studied civics, but it is not out of line with our history. It needs to be confronted and discussed in a rational way. What are the objectives and are they legitimate and justified? If justified, how can the adverse impacts be mitigated? This isn’t a partisan issue, even though Trump is a Republican. In history, Democrats were presiding during much of the hostility to minorities. The more shrill this debate gets, the less likely that we’ll have a rational outcome. Research buying real estate in China thoroughly as Chinese property law is quite complex. There are now no restrictions on the types of properties that foreigners are allowed to buy in China, and they can buy through an agent or directly from the developer or owner. Foreigners need to have worked or studied in China for more than one year to buy a property in China. It is important to be aware if buying an older property that developers or the government are entitled under Chinese law to make a compulsory purchase of the property if the land is needed for new construction work. The price they pay may be less than the price you paid for the property. New houses and apartments are not usually at risk. It is advisable to buy older properties only on a freehold basis, which requires higher buyout payments and is therefore less attractive to the government or developers. The other categories of property ownership in China are Use Rights and Owning Use Rights, each of which require lower buyout payments. No one in China has full ownership of a residential property and the land on which it is built. Residential land is usually leased for 70 years. * Find a suitable property and submit an official offer letter (through the agent if used). The letter sets out the agreed price, payment schedules and other conditions. When the offer is accepted a deposit of 1% of the purchase price is required. * Start to make financing arrangements if needed. Some foreign banks provide mortgage facilities for foreigners purchasing property in China. * The agency or legal representative carry out checks on the property and owner. In the case of some properties, there is at this stage a need to apply for the approval of the government and the public security bureau for the sale to proceed. * The seller and the buyer enter into an “official sales contract”. Foreign buyers must have their contract notarized. At this stage, a 30% deposit is payable to the seller. * An application is made to the government Deed and Title Office for transfer of the deed from the seller to the buyer, on payment of the relevant taxes and fees. Before this can be done, the current owner must pay off any mortgage that exists on the property. This process can take several weeks to complete. The ownership certificate is then issued, and the buyer pays the outstanding 70% of the purchase price and takes possession. The www.tourguizhou.com website is cooperating with Shirley Gallery to create a Holiday Party on behalf of local artists. The cost is 100 RMB per person . This covers all the food, drinks, door prizes, and entertainment. The event is December 27 (Tuesday evening), 6:00 PM to 9:00 PM. The location is on the river at Jian Daojie 72. 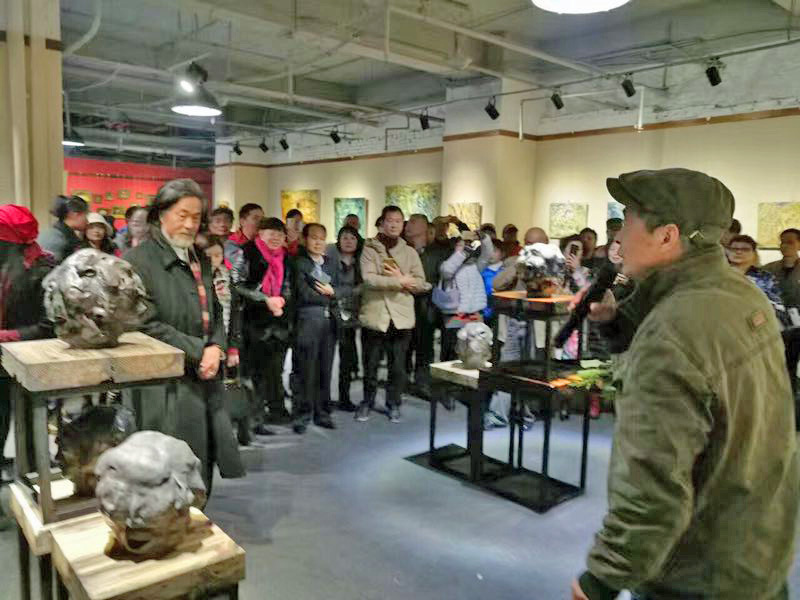 All proceeds from ticket sales are dedicated to paying the bills of the Gallery, and thereby support the art community of Guiyang. Many artists are permitted to display their work for free, and patrons are permitted to tour the gallery free of charge. The Gallery (second floor) and Restaurant (on the first floor) will be closed to the public on the 27th. This is a private party and is intended to support the artist community of Guizhou. 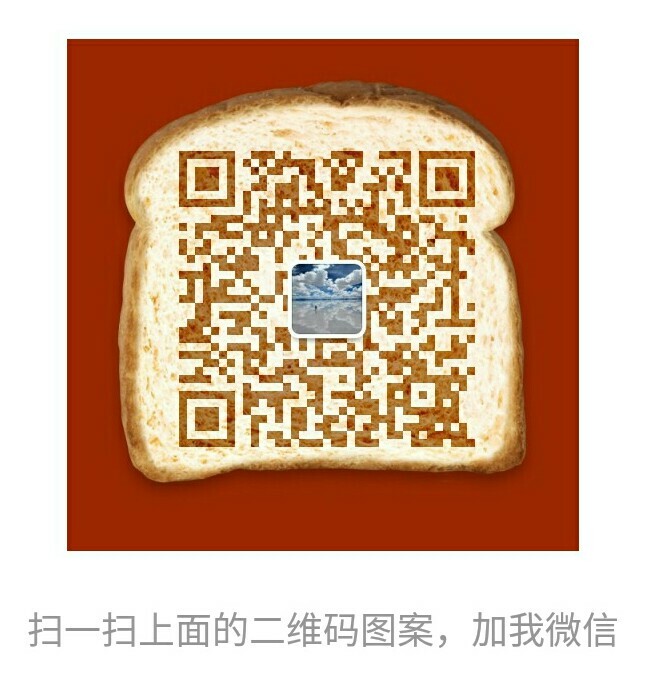 We are providing a Wechat link so you can buy your tickets online through Wechat. This is new for us, so we need your patience. 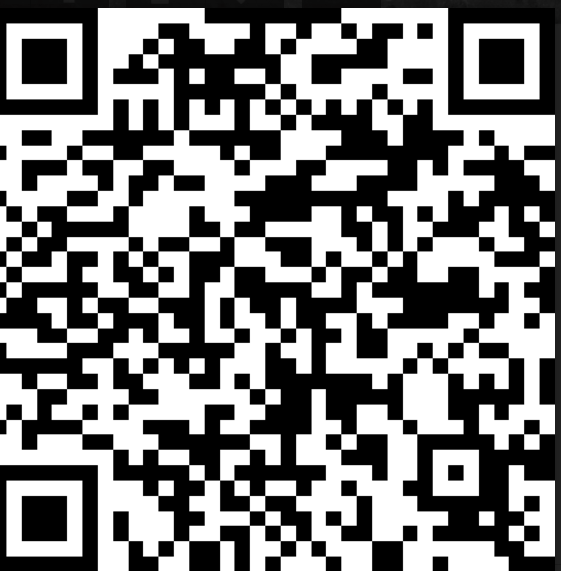 You will have to scan the Wechat link. This is Diana’s account, so if you are not Diana’s Friend, then you must first become a Friend, then we can compete the transaction. After you are a Friend, you enter your Name, Phone Number, and how many tickets, with names of guests. Diana will respond with the amount needed, and then you send the payment. Finally she will respond with “Got”. Then you will be registered. If anybody has trouble buying tickets online, please send an email to me at tourguizhou@gmail.com, or just call me at 13158092660 . I will find a way to get your payment. We need all tickets sold in advance so we can cover the cost of the event. Please respond by this Friday. 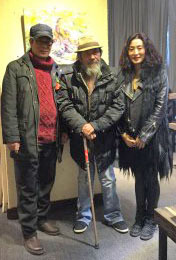 Speaking with Artist Yin Shi Long today, December 14, 2016, it was nice to learn about how the Artist(s) think about their work. 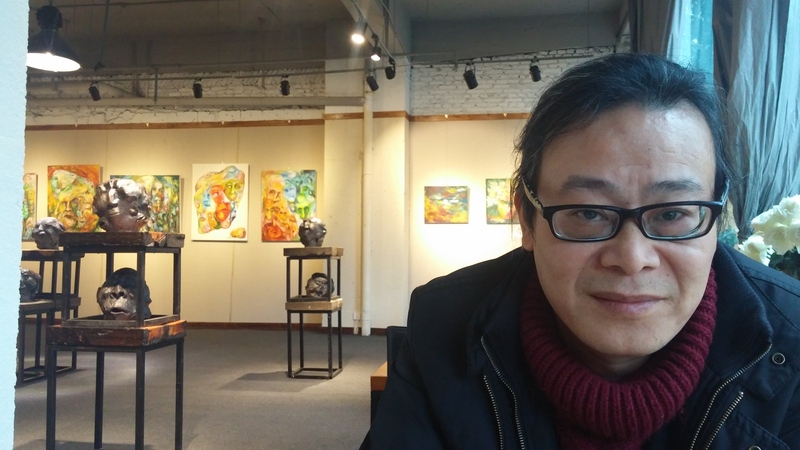 Artist Yin has been an active artist in Guizhou for many years. Although his work is truly professional quality, he has done many kinds of work to support himself, his wife and six year old daughter. Artist Yin paints murals for people, does photography, and teaches art. Over the years he has done many kinds of work, often with the artist’s eye for design. He comes from a family of working people, not independently wealthy. His father always had some kind of art in the home, especially the lifelike tiny figurines made of bread dough. Artist Yin’s Uncle Yin Guang Zhong (Uncle Yin ) was an inspiration to him and helped teach him in his teenage years. Today we talked about his thinking behind the paintings and abstract head sculptures. You may notice that the faces in the paintings have no eyes. Also, there are also no eyes in the sculptures. That is because many people are blind to the beauty of nature around them. It may have something to do with the fact that people are so busy making money. Many people only care about money. Some artists are criticized by their friends because they don’t make very much money. Yet the artists see the beauty around them. 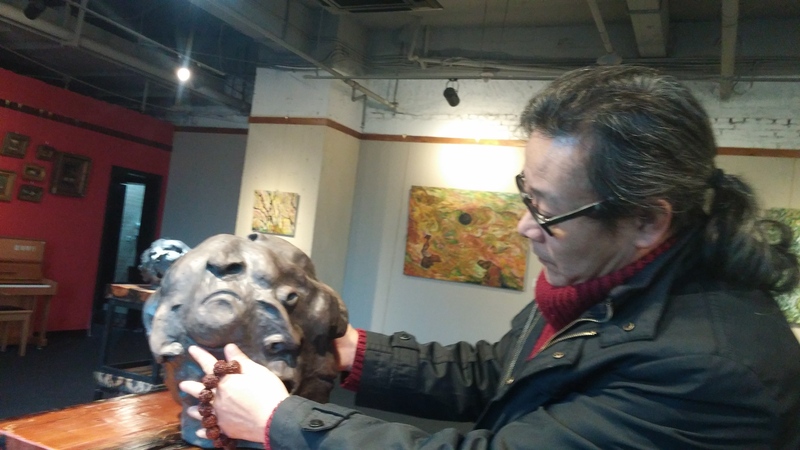 One painting is a called the Angry Stone of the Mountain God. It shows a natural stone in the Guizhou area that Artist Yin passes every day. The painting has a darkness, showing the anger of the Mountain God, which represents Nature. 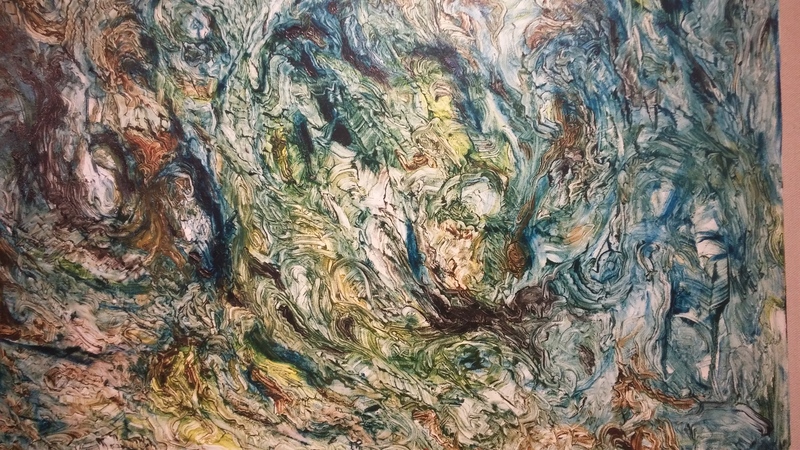 After Yin had completed the painting, his anger about the polluted environment was diminished. The art was a kind of release of emotion. Artist Yin explained that people are angry, but they don’t know how to express this anger. The artist can help create this communication. Like a volcano about to erupt, people have emotions which they do not express. Then sometimes there is an explosion. 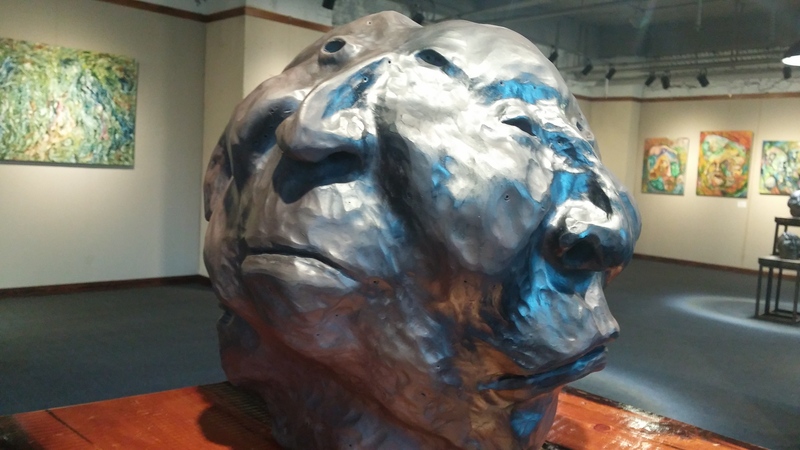 The many faces sculpture visualizes the moods of a person. A person really has many faces depending upon what the surrounding conditions create. A person can be good or bad, often depending on the environment that this person is in. You may feel that someone is a good person, but from a different angle, or in a different environment he is different. People can be good, bad, kind, frightened, aggressive, happy, or sad. Time and environment creates many faces for one person. From his father, Artist Yin learned how to use bread dough to make figurines. 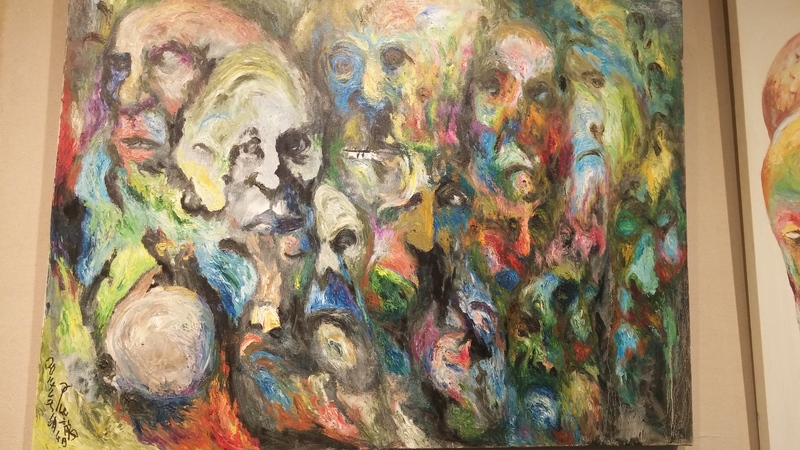 This work is not displayed this month at the gallery, however, he has given us some pictures of his other work. These particular figurines tell a Chinese story about the punishment of a bad person. Chinese have a long history. This story is one known to many Chinese, from the Qing Dynasty in Guizhou Province: “Mr. Ding Kills Andehai”. The Artist creates a mood for each person. Each person can see something different in the Artist’s work. Artist Yin gave us his visualization. The Art of Yin Shi Long will be on display at Shirley Gallery until the end of the month (Dec 2016).